As I roll through the door with bulging belly, it seems only fitting that my next post should be about the culinary delights to be found in Barcelona. There was a time, long ago, when I did not think food was so important, and ate mostly to fuel myself along, but this city, along with growing to realise there is more to life than hopelessly counting calories, has changed my outlook on food – Spanish culture and their attitude to food in general is something we can all learn from. 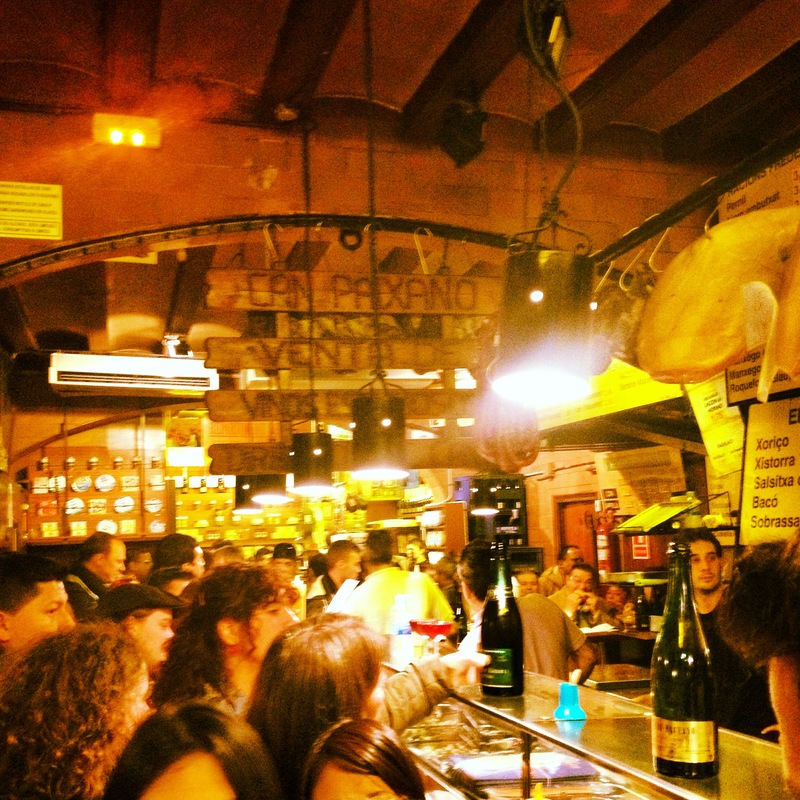 “Paella, rice, chicken!” are the shouts that greet you as you walk down La Rambla. Now it’s not so much walking, but fighting your way through the shirtless, burned masses who populate the city centre come summer. Big, glaring pictures of seafood, blackened rice, loaded ‘bravas’, and er, traditional sangria leap out at you from the restaurant windows. It never ceases to amaze me that the outside terraces down the seaside end of La Rambla are always crammed to the hilt, full of those sporting ‘I Love Barcelona’ hats and #10 footy t-shirts. If that’s your bag, don’t let me stop you, but before you cram that ages-old frozen potato, otherwise known as ‘bravas caseras’ (home-made), into your mouth, and before you sip that ridiculously sweet, overpriced and over-fruited sangria, let me tell you something: this is not what Barcelona is. 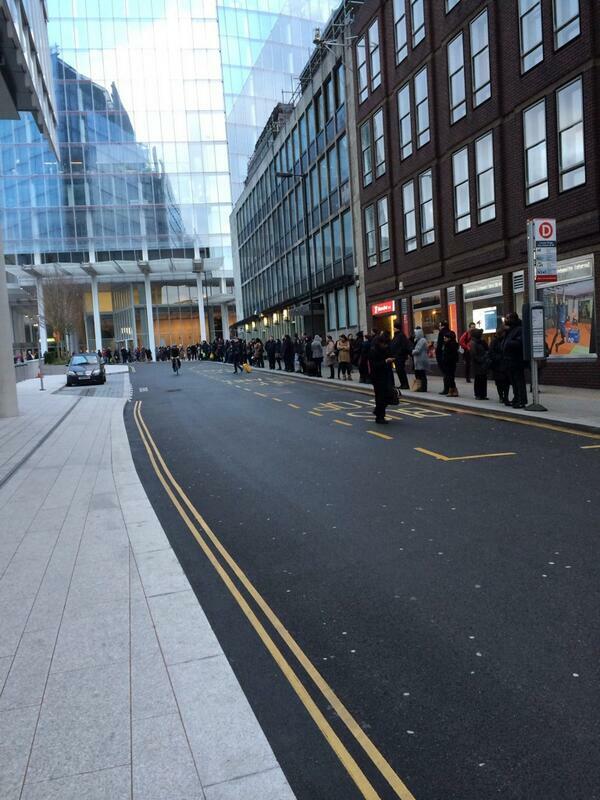 This is the same as going to Oxford Street and eating a Pizza Hut. You can do it anywhere in the world. The paella is frozen, but still costs the same as a real ‘casera’ paella, and the sangria, which isn’t even a typical drink of those who live here, is watered down so much it might as well be fruit squash. Sure, you don’t know where to go. Sure, it’s convenient. I know I’ve eaten in Pizza Hut in London, too. But even five minutes away, you can find a treasure trove of beautifully cooked, authentic food which is well worth the wait, and you won’t pay through the nose for it. 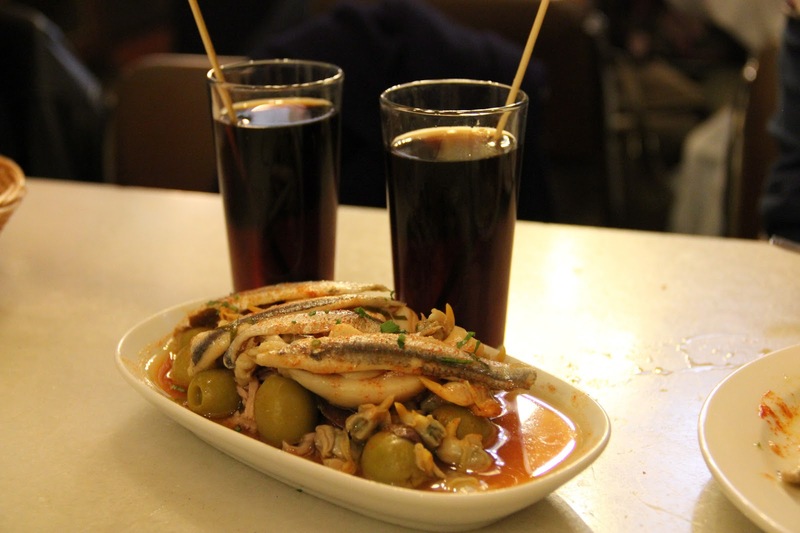 Food is a great part of daily life in Barcelona, and it is meant to be enjoyed. If you only have a day or two to enjoy the city, then try to eat as well as possible, but I understand convenience might be the best way to go. However, if you’re here for a longer spell, read on for some tips on where to eat like a local. Ok, so I started with drinks, you got me – but it’s impossible to live in this city and not enjoy the culture of ‘Vermut’. It doesn’t actually just mean drinking vermouth. There is an art to this. 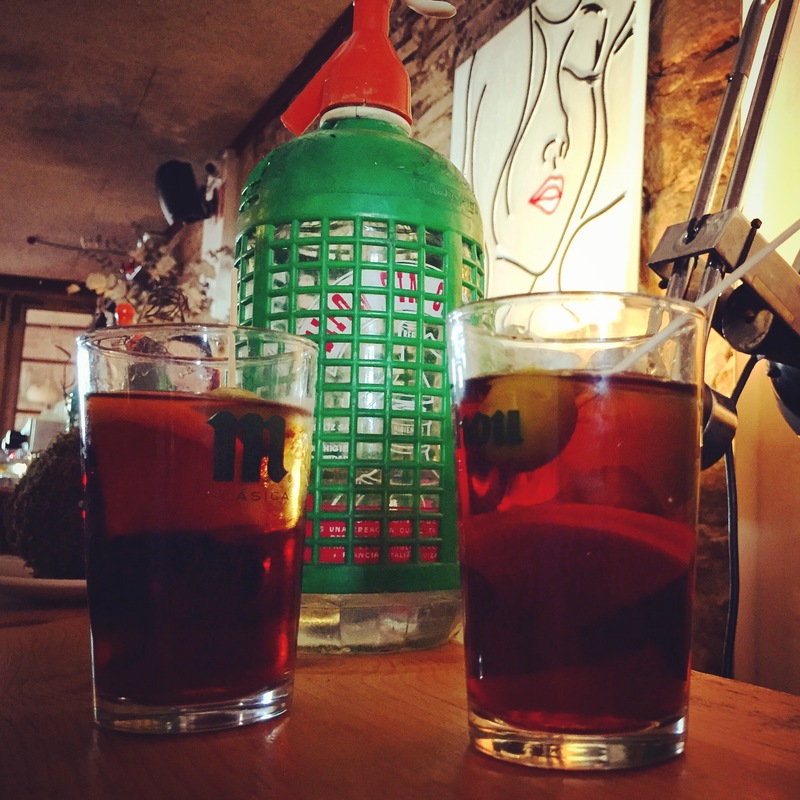 On Sundays, locals flock to bars, order a ‘vermut’ and sit with a soda siphon, topping up, and eating raciones de tapas as they go. The vibe is jovial, relaxed, and friendly – meeting and watching the world go by as the sun warms your face. I hate vermouth, but I love the idea of what is pretty much an alcoholic brunch. Order yourself a vermouth, some chips de patatas, ‘berberechos’ (cockles), ‘almejas’ (clams), and don’t forget sauce to put on it – Salsa Espinaler, famed across Catalunya for putting on your seafood tapas, is a blend of spices with works particularly well with all the aforementioned tidbits. They even have their own bar in the nearby beach town, Vilassar de Mar, if you fancy catching the train and spending a relaxing Sunday at the seaside, away from the throngs. Bormuth, Plaça Comercial 1, El Born. Bodega Marin, Mila i Fontanals 72, Gracia. Pintxos, actually a Basque tradition, are famed all over Spain. The premise is an individual ‘tapa’, held all together with a stick – when you’ve had your fill, the waiter or waitress counts your sticks, and you pay for each one. You can try all manner of typical Spanish food this way, at the small (general) price of one euro. Head to Calle Blai, near Paral.lel metro, where ‘Pintxo Alley’ is located, to experience a wide array of treats-on-sticks (so far removed from cheese and pineapple on sticks). The entire street is full of bars and cafés offering a variety of more traditional (croquettes, Spanish omelette) to the experimental (falafel, kebab meat). Many will offer deals on a ‘caña’ (beer) and pintxo together. Tapas is also offered at most of the bars, so why not try a bit of both? Be sure to try ‘pimientos del padrón’, small fried green peppers, covered in crunchy sea salt. Some notable pintxo bars on Calle Blai are Blai Tonight (23-25), and La Tasqueta del Blai (17). Catalan food, it must be said, is not one of my favourites in world cuisine, but it is certainly worth a try – think hearty, earthy, more home-style meals, which is not at all to be sniffed at and you’re sure to leave with your stomach bulging in content. Washed down with a great wine, the rustic element of Catalan food is very enjoyable, particularly if you want to escape the typical, infamous frozen paella. Whatever you order, make sure it’s accompanied by pa amb tomàquet, the delicious bread rubbed with tomato, olive oil, and sprinkled with a dash of salt. Some notable dishes are botifarra amb mongetes (sausage with white beans), escalivada (grilled vegetables, typically aubergines and pepper, then served with what often feels like a sea of olive oil – but trust me, it’s delicious), and, if you’re here in the earlier months of the year, calçots. These thin onion/leek hybrids (taste of an onion, size of a small leek) are a Catalan staple and are absolutely not to be missed. Calçotadas, a special kind of barbecue where calçots are roasted on an open fire until blackened around the edges, dipped in romesco sauce, then eaten in the messiest way possible – you strip off the skin and then dangle the juicy inside into your mouth – followed by various grilled meats, are widely enjoyed all over Catalunya. 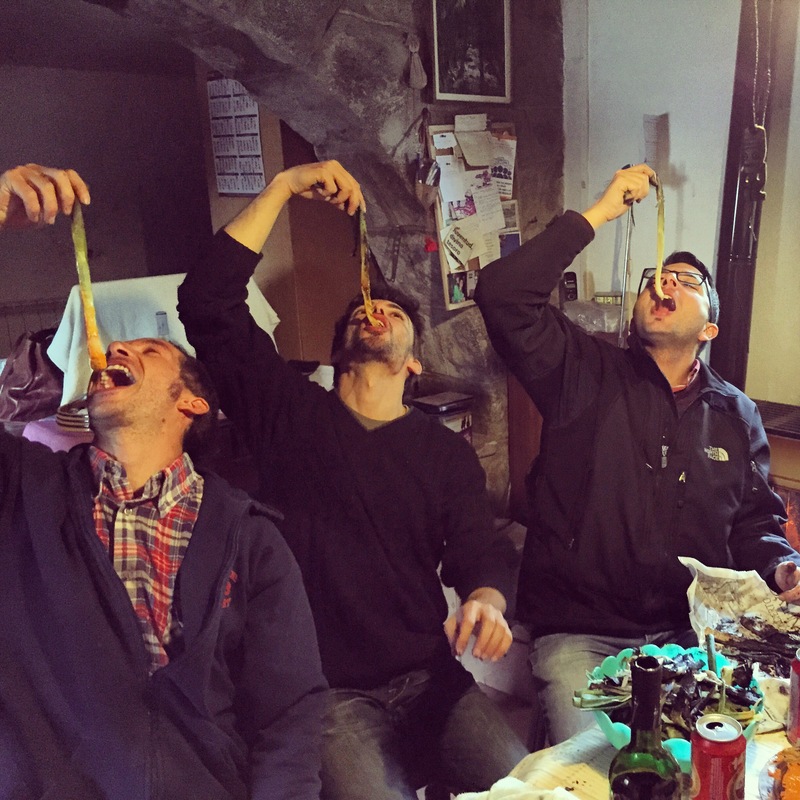 Both a cultural and gastronomic treat, you can attend municipal Calçotadas if you’re willing to go a little out of the city. Calçotada dates vary from year to year, but check on local websites and places like meetup.com, where they will often be advertised. 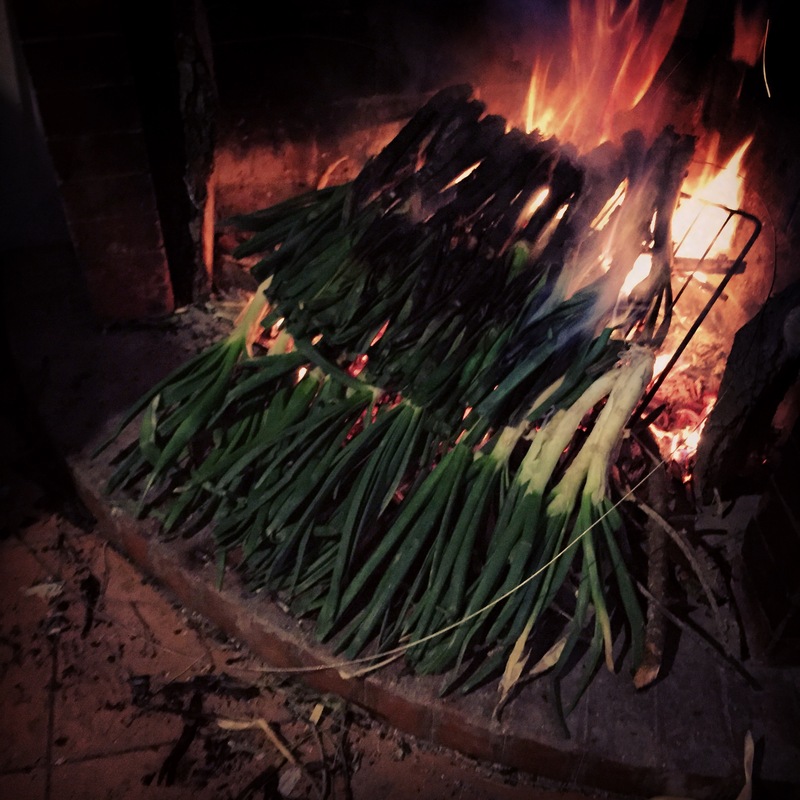 How to eat calçots – it certainly isn’t pretty, but it is fun! Ciutat Comtal (more tapas style, and if you’re willing to wait for over 30 minutes – no reservations are taken), Rambla de Catalunya 18. Can Culleretes (going since 1786), Career d’en Quintana 5, El Born. El Toc de Gracia, Carrer de Bonavista 10, Gracia. La Panxa del Bisbe, Torrent de les Flors, 158, Gracia. And what you’ve been waiting for…fish! So, Catalan and Spanish cuisine are different, that’s for sure. But that doesn’t mean you can’t get a mean paella here. I’m no fish eater, unfortunately – I would so like to be, as the variety on offer and freshness of the seafood here is incredible. I am, however, dragged around to many a fish restaurant as my other half could eat the majority of the fish in the Med, if he so wished – so I do know where to go. Some of the best fish to be had will obviously be found by the port, where you can find everything from tourist trap to high class eatery. Any place that has a picture of a paella outside is to be avoided – no exceptions. Before you go straight in with the rice, though – consider your options. Another popular dish here is fideuà, typical of Valencia, with the same principle as paella but made with thin, vermicelli-like noodles. Taste this with a whacking dollop of allioli (garlic sauce), and you’ll reek for days but be happy for weeks. 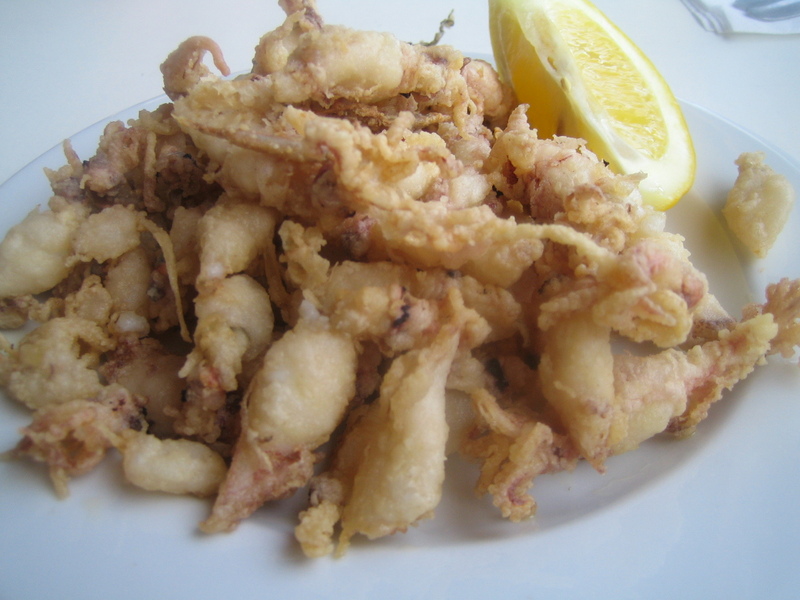 Other notable things to try are chipirones, which are small fried squid, chocos (other squid-type friends), pescado frito (fried fish), paella negra, and most types of salted fish – salted cod is typical here, too. You’ll probably be in fish-heaven with most choices on the menus here, so if you’re a seafood diehard, the Costa Brava and Barcelona is the right place to be. Cal Pep, Plaça de les Olles 8, El Gotico. La Taberna Gallega de Marcos, Moll de Gregal, 23, Barceloneta. Not the most beautiful of foods, but a huge hit here. Can Paixano (La Xampanyeria) – champagne at cheap prices, big cuts of catalan sausage and other typical tapas treats to be enjoyed – what’s not to like? Carrer de la Reina Cristina 7, Barceloneta. En Aparté – French run bar, generous portions, cheese platters, delicious wine, desserts, and crusty, beautiful bread (oh God, I’m drooling). Carrer de Lluís el Piadós, 2, El Born. Kiosko – burgers that everyone talks about, queues often out the door – yes, we can say that about McDonald’s too, but this is the real deal and you’ll pay more or less the same for a more enjoyable burger right down by the sea! Av. del Marquès de L’Argentera, El Born. Mosquito – tapas, Asian style. Dumplings galore. I could eat the dumplings from here every day. If I go, I pretty much order dumplings in all shapes and sizes – who needs anything else? Wide range of beer, including gluten-free, at very good prices. Carrer Carders 46, El Born. The world media reported recently that 80% of Catalans voted a strong YES! to the question of being independent. I saw the headline in numerous papers, which surprised me as I have always thought that those behind the broadsheets really put some research and effort into what they put onto the page. The articles did go on to say that this 80% was only a representation of 2.2 million, not the 6 or so that actually live here, but that is by the by. The grabbing was done. Many who simply read the headlines would be inclined to believe the majority of those who live here are solidly sliding a ‘yes’ into the ballot box. It is impossible to avoid the independent sentiment when living in Barcelona. Even in English classes, arguments are quickly nipped in the bud, through answers of ‘Catalan’, when the students are asked their nationality, and ‘Catalonia’, when asked the name of their country. It takes a great effort for me to stay silent, and swiftly move on. I don’t disagree with their feelings and the strong passion they have, but technically it isn’t a country, as some others in the class have oftentimes felt stirred enough to remind us, demanding to see their classmate’s passport. You can see why I now ask questions relating to MY nationality, or a famous person, rather than bring up the dreaded Catalan/Spanish debate. In an English class, it’s just not necessary. The streets are festooned with Catalan flags, plastic yellow bows (hang the environment), and proud proclamations of what the householders are voting. It does look pretty to see the red and yellow stripes, especially on a warm summer’s day. I have no problem in seeing people’s pride displayed. It’s just when voices start being misrepresented, not only by the papers abroad, but also by the Spanish government, that I begin to have a problem. On the 9th of November, an unofficial referendum took place across the region. This referendum had been declared illegal by the Madrid-based government, and attempts to make it lawful were quashed again and again. You can see why Catalans feel nothing but fury towards the government, in what is supposed to be a democracy. They are ignored again and again by those who are supposed to listen and implement change for them. The money they pay in taxes is sent to other parts of the country which are less well off. This is expected, I hear you say – and I agree, but when it gets to the extent that those whose money is being taken are not those who receive, by a long run, then it becomes a problem. Children in other parts of Spain enjoy the advantage of having one computer per child in school. Here, this is certainly not the case. The money is being sent to help less well-off parts of the country, but it needs to be spent in a sensible manner, rather than in such a way that seems to only seek to rile the more wealthy regions. 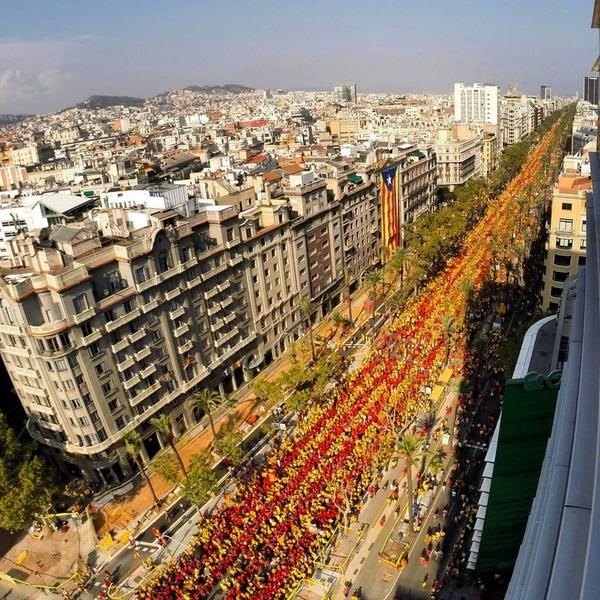 Catalans have held an annual protest on September 11th about these injustices and the right to decide their own future. This year (2014), 2 million people formed a ‘v’, visible from the air, to state their solidarity. In Madrid, and the rest of Spain, it was reported only 100,000 people turned out. 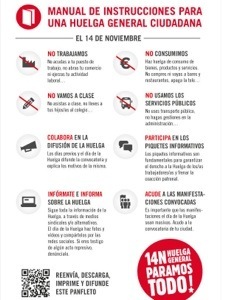 On the 9th of November, 2.2 million people voted in the illegal referendum. I was not one of them. I would very much like to vote. Why didn’t I? Because whilst I agree with the idea that Catalans are not heard and are largely trampled on by the government, I did not see the referendum as ever fairly representing the region. 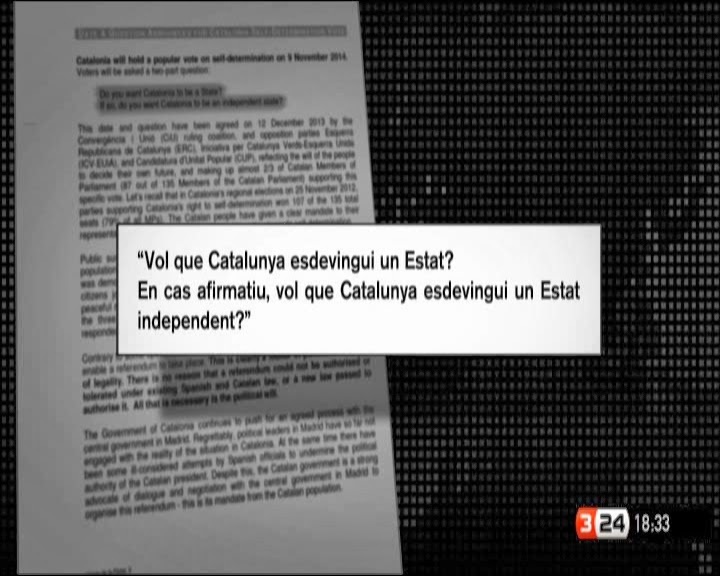 It was organised by a pro-independence institution, and held in schools, rather than officially recognised and government endorsed ballot posts. The weeks running up to the vote, there was no ‘no’ campaign, as there was in Scotland. I only ever saw propaganda relating to the ‘SI-SI’ (Yes-Yes) side. 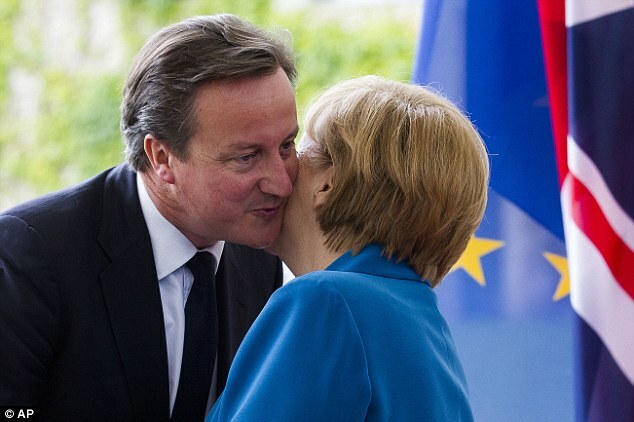 Thousands and thousands of euros were spent on this. I can’t back an election that is biased, nor one that uses money that could be spent on other things instead of producing a skewed vote. In other places, maybe the government would take heed of the millions that stated they wanted independence, but Rajoy (the president of Spain) is stubborn. He will not take the chance – therefore only making things worse. The more you keep people silent, the more they will want to say. Those on the ‘no’ side will change their mind. I do not agree with those that say the 2.2 million are a representation of the people who would vote in the real election, should one ever be held. I believe the turnout would be as high as it was in Scotland. 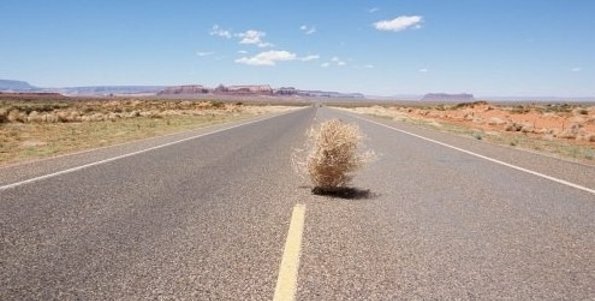 Some blamed apathy and laziness on the reason for some not ticking the ballot papers – but I doubt something so important, on the day of a genuine election, would be ignored. I want to hear both sides, see what both parties promise me, before I make up my mind. In my view, I feel as if someone followed me around shouting ‘YES’ in my ear for a month, flashing with red and yellow lights so I even thought of Catalonia when I closed my eyes. The arguments are so persuasive it even changed me from a ‘no’ voter for the first half of the vote (Quiere que Catalunya sea un estado? Would you like Catalonia to be a state? ), to a ‘yes’. Those who organised the vote proudly proclaim ‘Now is the time’, asking us to vote with a resounding ‘Yes’. I never saw one ‘No’ poster. Artur Mas, the Catalan leader, promises independence within 18 months if he is voted in with a majority in the next local elections. It all seems a bit fishy and tactical. Nowadays, it’s difficult to find such a thing as impartiality, especially in a place such as this, where ‘national’ sentiment is through the roof, to the point I have only seen with illiterate lager louts on St. George’s Day (I’d like to note that those who display such pride, however, here are not made of the same stuff). I can only hope that voices such as mine will be represented should the vote ever be given to the region. A good move to secure more ‘yes’ votes would be to eliminate immigrants from participation. In the meantime, I will continue keeping my head down and my mouth shut, in order not to be dragged into an argument I’ve had a thousand times…and look set never to win. Living here over the past year, I’ve come to meet many people who wish to fight for Catalan independence and proclaim proudly they are Catalan, through and through. Quite understandable from a state with a rich history, and a background of oppression from the Spanish, whom many do not wish to consider themselves affiliated with any longer. Before coming here, I hadn’t quite realised how extensive the language and patriotism was – how there are genuinely people who struggle speaking Spanish, who don’t even like doing it, and who feel completely separated from a nation they are still part of. Catalonia, specifically Barcelona, is interesting, as you seem to get a split down the middle between Catalans who want independence, and those who really don’t mind one bit and would rather stay part of Spain. Everybody agrees that the cuts and the taxes are extortionate, but that’s what richer parts of countries do – pay more tax. I can see it’s frustrating, but to me it seems the politicians have jumped on the public’s unrest and become deadly serious about Catalans becoming independent. I myself have no opinion on whether they should or shouldn’t – it’s not my place and I don’t wish to rock the boat with people by talking about it. It makes for awkward moments in class when it is brought up as in a lesson of around eight people, you’re likely to have them split down the middle in their opinion, and quite honestly they’re venting to the wrong crowd – I’m an English teacher: I’m there to teach them how to contract and pronounce properly, not to preside over a debate. Artur Mas, the Catalan president, called a vote two years early, expecting that the public would once again vote him in, in a majority. Whilst they did vote for him again, he lost a number of seats, something I’m sure he wasn’t expecting. During his time as president, he’s brought in austerity measures, and asked for extra cash…something I think the public resents, naturally. 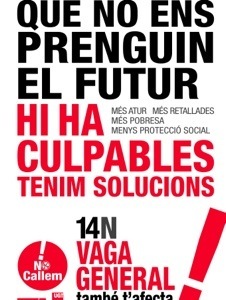 La Vaga, held recently, meaning ‘strike’ in Catalan, was mostly down to lack of work and cuts, but I felt the undertone, as we all did in the city: the deep-down message for independence which is plastered all over the city walls at the moment. Bright yellow posters proclaiming now is the hour for the people to rise up and shout for their independence. Walking the streets on Vaga day was eerie. Most shops and banks were scrawled over with the words ‘tancat per la vaga’ (closed for the strike). Placa Catalunya, normally teeming, was unusually quiet, like the calm before the storm, when I walked into town around midday. At night, from our flat, we could hear the horns, the shouts of protest, and the whistles; a cacophony of disgruntled Catalans, and Spanish, alike. Catalunya has a large economy, worth more combined than Portugal and Andorra, which for a region of 7.5 million people is pretty good going. This said, if they leave Spain, they’ll have to re-enter the EU, which sounds pretty difficult to me. What if they can’t? Do they go back to the peseta, which surely would be devastating? The region exports mostly to Spain and the EU, which means they must keep a good business relationship with their neighbour. I understand why they want independence, and part of me sees the appeal, too. A vibrant cultural history, very different from Spain, would be celebrated and recognised alone. I think sometimes we need to look at a much bigger picture, though, even bigger than just Spain, and just recognise we are all part of the same world. To me, I’d rather be part of something larger than separate myself and become smaller, but I haven’t grown up in a country like this, and don’t know what it feels like to want my own cultural identity, as I have a rather strong one myself. We could all debate about this until the cows come home, but I wonder what’s in the future for this region. Watch this space, and until then, stop debating about it in English class…you’re making the poor foreigner uncomfortable. Artur Mas…Catalan style. The equivalent here of Bremner, Bird, and Fortune.